We are a group of speech and language therapists (SLTs) who all work for Alex Kelly – a speech therapist who is recognised internationally for her work and her publications. Alex left the NHS after 23 years’ experience and 8 years’ of managing a SLT service. The SLTs work part time in schools around Hampshire and Dorset and some work part time at Speaking Space, a day service that we run for adults with autism or a learning disability. All of our staff are HCPC registered and members of the Royal College of Speech and Language Therapists and are CRB checked. What type of schools do we work in? We all have different areas of interest and skill, so we always try to give you the best speech therapist for your needs. We aim to provide you with a service that is tailor made to suit your needs whether that is assessing children’s speech and language needs or working within the classroom – we will listen to what you want and then agree what we can provide. If you already receive SLT from the NHS, we are able to supplement that and we have experience of working successfully alongside our NHS colleagues. How do we ensure a quality service? We constantly measure effectiveness in all the work we do through the use of SMART targets. 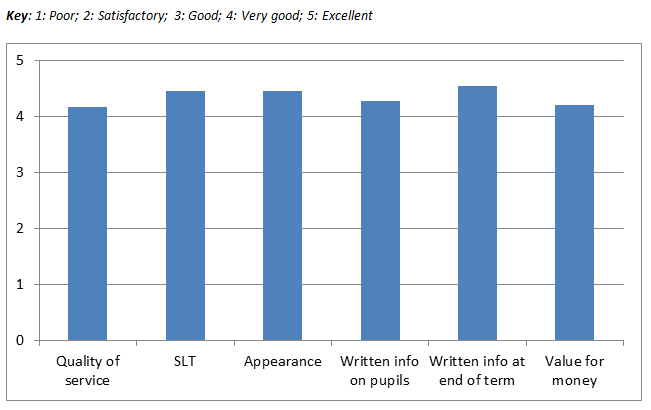 The progress that the pupils have made will be presented to you in an end of year report. What do our current schools think? This can vary depending on individual factors such as location, travel involved and the complexity of the school i.e. is a more experienced therapist required? As a general rule for schools in Hampshire we charge around £250 per day, £180 for a half day and £70 per hour. Please ring us if you would like to discuss your individual schools’ needs further.